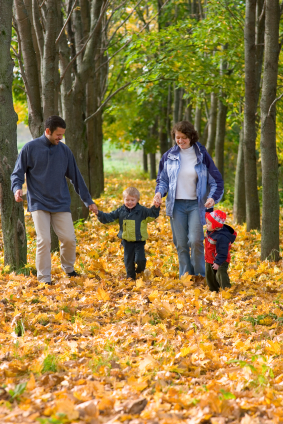 Fall is a fantastic time of year to enjoy some crafts that emphasize the bounty of the fall harvest. Most people carve pumpkins around Halloween, and some families even try making caramel apples, but here is another option for fall harvest crafts. Collect a few pinecones that are interestingly shaped and in good condition. Larger pinecones will stand out more, but smaller ones can also be fun. Lay out some newspapers to protect your work surface from any paint. Now using the paint brushes and paints, paint each pinecone in your original way. Allow the paint to thoroughly dry. Once the paint is dry, with adult supervision, dab a moderate dot of hot glue onto the tip of the pinecone. Before the glue dries, place one of the loops into the hot glue. The loop should be standing up, so you can tie a ribbon through the loop after the hot glue dries. When the glue is dry, cut a long length of ribbon and tie one end to the loop on the pinecone. Now you have a hanging pinecone decoration. You can hang these outside around your porch, on your door or inside as fall decorations.